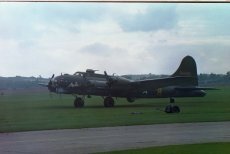 Duxford Aerodrome was one of the second world war airfields used by the RAF and later the US Airforce. The aerodrome was used for training of pilots for the first World War and was in operation up into the 60's. In July 1961 the last operational RAF flight was made from Duxford. 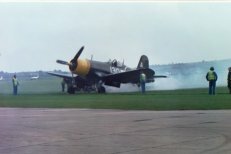 Cambridgeshire County Council joined with the Imperial War Museum and the Duxford Aviation Society and in 1977 bought the runway to give the abandoned aerodrome a new lease of life. 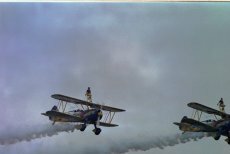 It is a unique opportunity to view many historic aircraft and also see the rebirth of many of our forgotten aircraft, many to flying condition. Read the full history of the Duxford aerodrome at the IWM site. 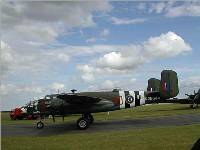 A visit to this part of flying history is recommended for any flying buff visiting the UK. Get there by train to Cambridge and a free buss service to the aerodrome. The additional Land Warfare museum is also mandatory taking one into the trenches of WW1 and then the D Day landings in Normandy. The American Air Museum stands as a memorial to the 30,000 Americans who died flying from the UK in the Second World War. Spend a full day there. 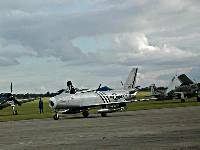 Have a look at some of my favourite aircraft on the flight line and in flight at two of the past three airshows that I have visited whilst living in the UK. The day started out being a bit overcast, but it cleared early in the sun shone for most of the day with clouds and rainstorms passing through. It was so nice in the morning that I left the umbrella in the car - always a mistake in the UK!! The viewing area seemed to be extended this year alleviating the crowding that we experienced at previous events. The flight line walk is a must and the period costumed people did add some character to the event. For £4, the walk is a must. 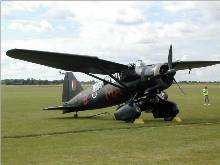 I guess the impressive thing about this years show was the two B25's and two B17's, the Immaculate Lysander which looks too good and probably nothing like an original production model. 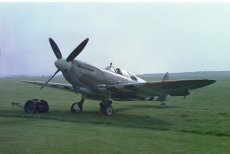 The Griffin Spitfires are always impressive with that strange sounding engine, and the crackling of the exhausts when the throttle is shut off. 11 Spitfires in the air at one time and a final flypast of 25 aircraft. More heavy metal with the much loved by Bomber pilots P51 and all D models The Battle of Britain workhorse Hawker Hurricane The Hawker Hart didn't fly, but the Gloucester Gladiator did. The workhorse of all the WW2 operations in Europe and the Pacific The wonderful Corsairs used by US heroes as "Pappy" Boyington. Is the Connie a flying legend? 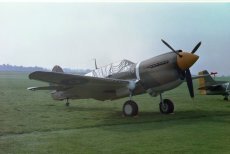 The following are some photos of the aircraft that I like. I did attend the 1999 Autumn airshow, so these add to my collection. This year the weather wasn't real good with early morning fog and at Noon the cloud base was about 100 feet (33 Metres)and organisers were looking to reorganise the show, but at 1:45pm the cloud broke and we saw the sun on and off, and the show started at 2pm, right on time. Only one aircraft, a sea vixen, did not attend as it was rained in at Yeoville Fleet Air Arm. Enjoy the photos and take any that you want. The Utterly Butterly wing walkers and their Boeings One of my very favourite aircraft, this is one of three at Duxford, the others in NZ livery. Imagine a whole flight of them blowing that much smoke. 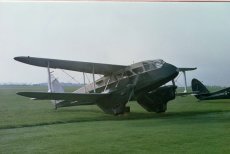 A rare twin seater Spitty, flown on the day by Carolyne Grace, originally from Goulburn, NSW. The Spitfire is now housed at Duxford. This aircraft did not fly in 1999, but did a very impressive display this year. 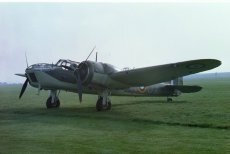 For more information on this plane and how to help keep it flying look at the Supporters club site. Can't remember seeing this being restored, but another beautifully restored aircraft. 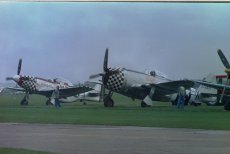 The timeless Mustang, and sounded great, and the larger P47 Thunderbolt. Two of the famous US WWII workhorses. Many bomber pilots were gratefull for the P51B. Some old favourites of mine. This is an Australian Aeroplane, the Wirraway, designed and built here during WW2 as a trainer, but was used in action over Darwin and in New Guinea. Looks very much like the "Harvard" or "Texan" trainer. Click the picture to view the photo gallery. This is a Super Constellation that was rescued from the Arizonza desert graveyard in the USA. A consortium of interested people got together and spent more than a year to get it back in the air and here to OZ. These pictures were taken at the Richmond RAAF base for their 75th anniversary air show. Click on the Connie for enlargements. From accross the Tasman, some Kiwi Aircraft images. Model Aeronuatical Association of Australia home page. Gliding Federation of Australia home page. The only way to fly. Duxford Museum the aircraft annex of the Imperial War Museum - a must see.